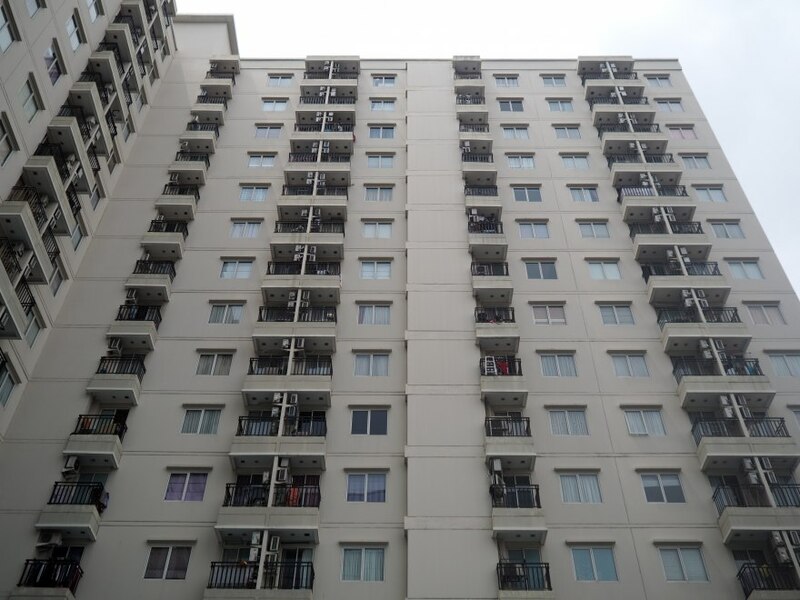 Signature Park Apartments is a budget apartment complex featuring one single tower of 20 floors, for a total of approximately 1,000 units. 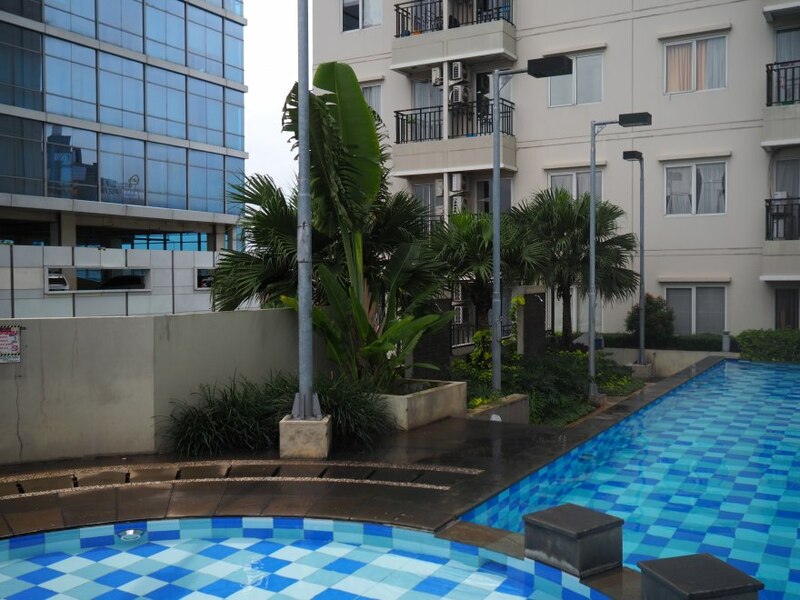 Note: Signature Park is owned by the Pikko Group, which is also developing Signature Park Grande, a large apartment complex that opened in mid-2018, also on Jalan MT Haryono. I will review it separately as soon as possible. 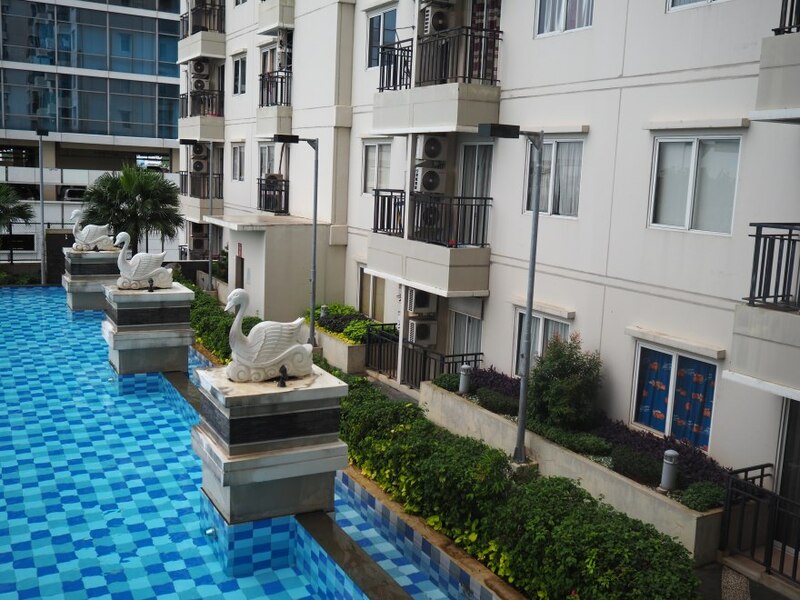 Signature Park is in Tebet, and more precisely in Tebet Timur, a middle-class neighborhood at the East of Jakarta. It is mostly low-rise and residential, except along the main streets where you can find several towers (offices, apartments). This is the case along MT Haryono, a major road that runs parallel to the Jakarta Inner Ring Road (Toll). You need at least 15 minutes to go across the street by car! At the South gate, you have Jalan MT Haryono, a large road with a massive traffic and very few interesting shops. At the West and North gate, you have small lined with low-rise accommodation (from low to upper-class). You can go to a handful of warungs and to the park Taman Honda, probably the highlight of the neighborhood. 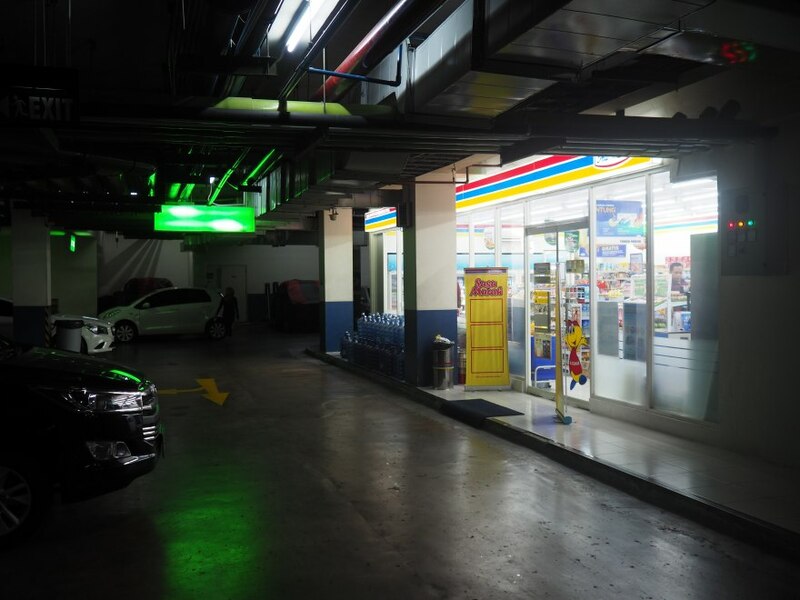 There are a few available supermarkets within 5-10 minutes by car: Gelael, Superindo and Carrefour MT Haryono. You can also try shopping in local markets for fruits, vegetables and meats (Pasar PSPT or Pasar Tebet Barat, both about 1,5 kilometers away). There is a cheap (but rather uncomfortable) food court besides the parking in the basement of the residence. 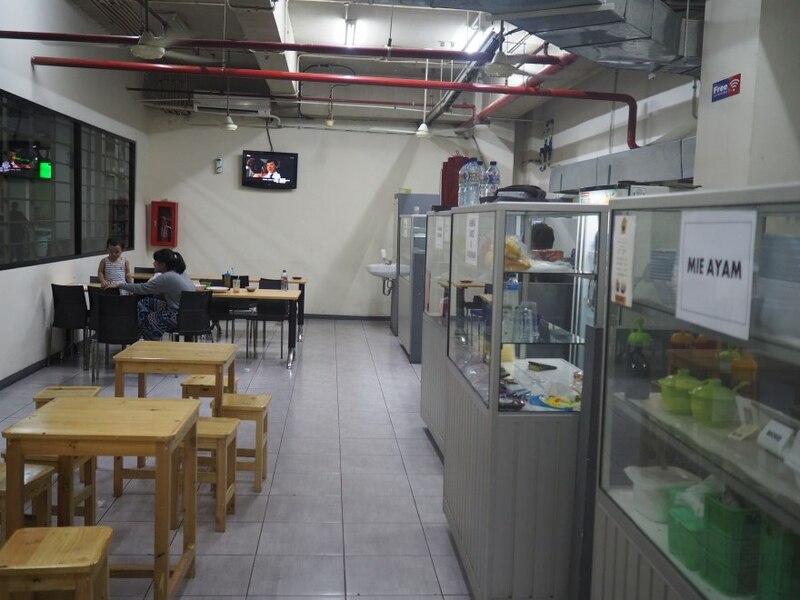 For better food, you go to TIS Square on Jalan MT Haryono (Pho 24, Citrus Café, Tiga Nyonya, Sushi-Ya, etc), about 10 minutes away. Also, you have some street food and 2 warungs walking distance in the kampung area behind Signature Park. Only local schools: SMA, SMU, TK, etc. RS Tebet is about 10 minutes away by car. It is a general hospital for the low to middle class. Another one, RS Medistra, is about 20 minutes away. 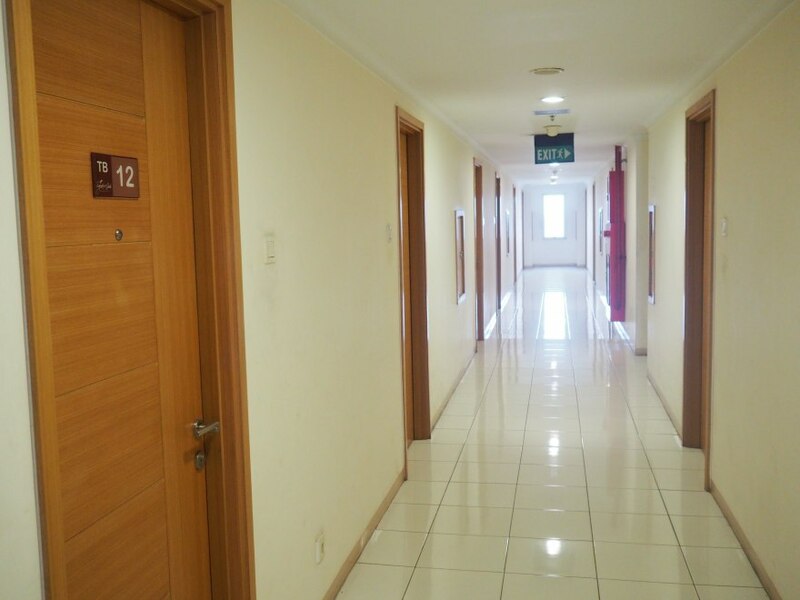 There is also a small clinic within Signature Park Apartments (Pearl Medic, or PT Mutiara Medical Service). 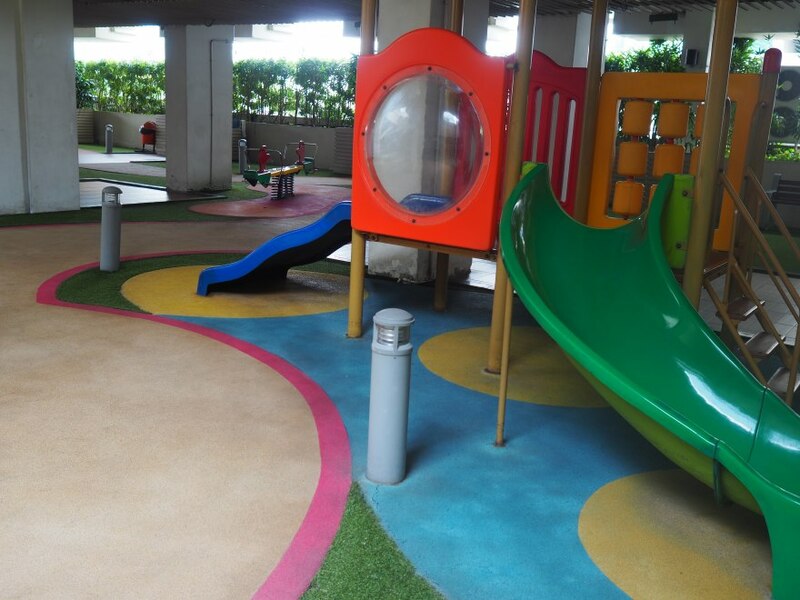 The park Taman Honda Tebet is 10 minutes by foot from the complex. It is not very clean but convenient for those who like to jog. 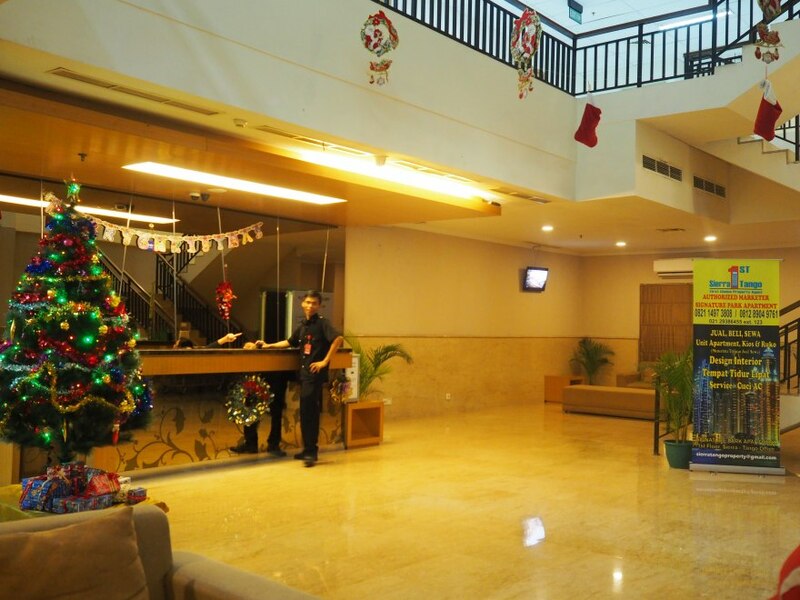 There are a few office buildings along MT Haryono such as Menara MTH, Menara Hijau, Graha Adira, Wisma Pede, Wisma Millenia or Graha Pratama. 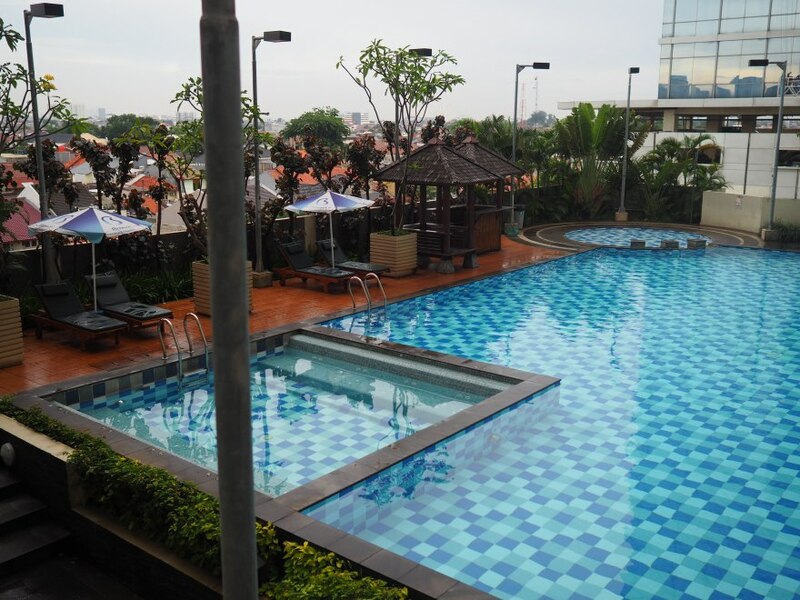 The real Central Business District of Jakarta, in Sudirman, is about 30 minutes away. Signature Park is in front of Jalan MT Haryono and the Jakarta Inner Ring Road. This is a major axis in Jakarta as it links some important areas like Grogol, Semanggi, Sudirman, Gatot Subroto, Rasuna Said, Cawang, etc. Even though the toll gate (Cawang) is only 400 meters from the residence, it is often very difficult to reach it because of traffic jams. At the moment, this is one of the worst areas in Jakarta for traffic jams. One of the reasons is that the LRT is currently being built and the workers occupy a lane on both sides. Once the MRT will be completed, I hope that the situation will improve. Make sure you tell him that it is Signature Park and NOT Signature Park Grande. Cawang station is 500 meters away (10 minutes by foot). It is a stop on the red line from Kota to Depok and on the yellow line from Jatinegara to Bogor. 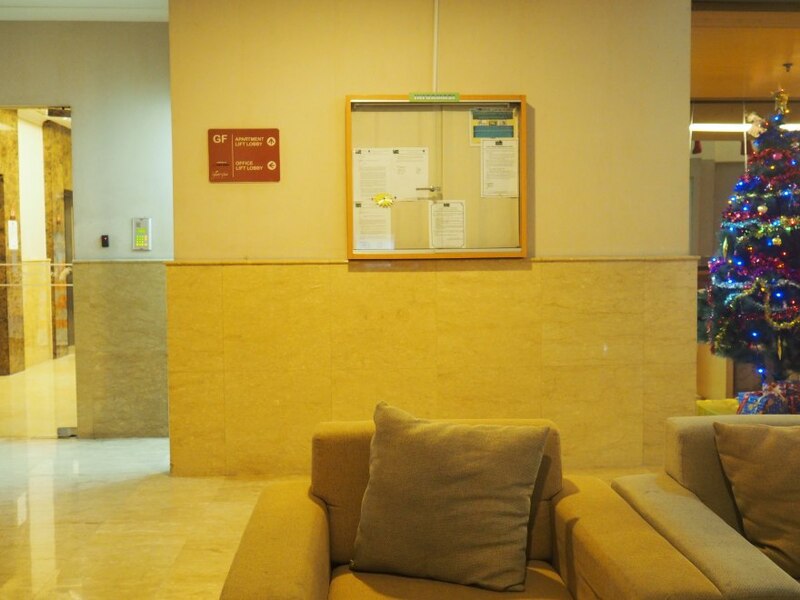 It is quite convenient to reach the Central Business District as there are stops in Karet and Sudirman. An LRT line is planned on Jalan MT Haryono and it should be completed in 2019. I suppose that the station will be merged with Cawang Station. This is an interesting development for Signature Park as this could mean less traffic and more options to go to Central Jakarta. Yes, there is a decent sidewalk along Jalan MT Haryono. 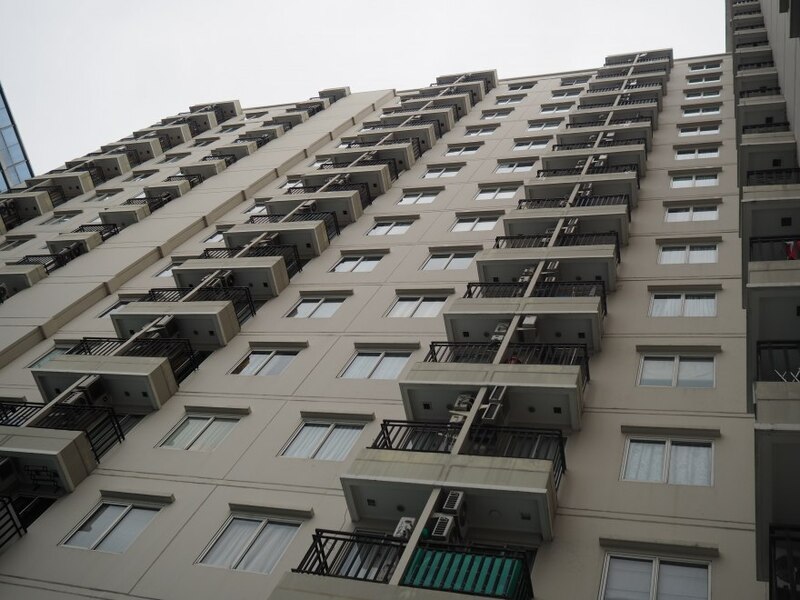 The developer, PT Pikko Land Development, is a medium-sized company that owns a variety of apartment complexes ranging from low-end to upscale ones. 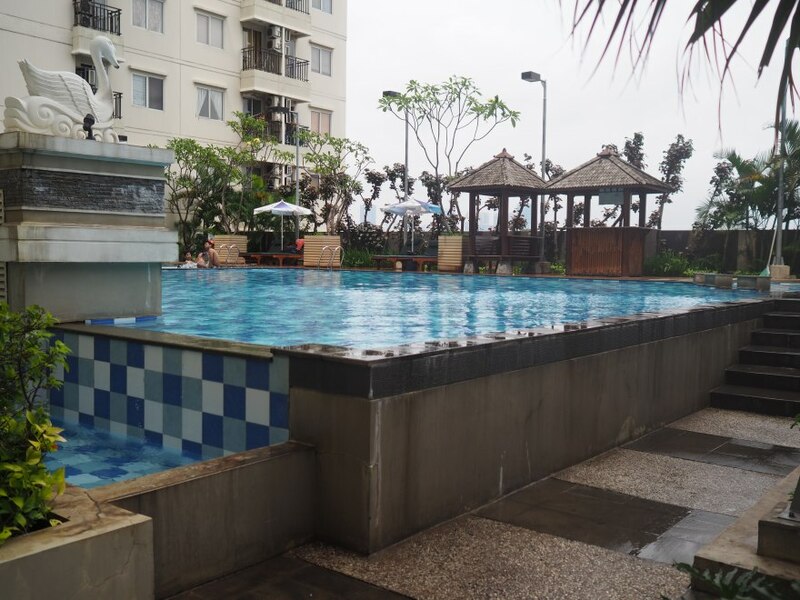 The ones I’ve reviewed so far are Maple Park and Hampton’s Park, both of which were quite disappointing in terms of maintenance.They are also behind Botanica Residence, Sahid Sudirman, and Grand Kemayoran. They had a few issues with their residents, particularly in Signature Park where people complained about their certificates (please read this article for more information). Overall, I would rate their reputation as average and I would recommend being cautious when buying from them. 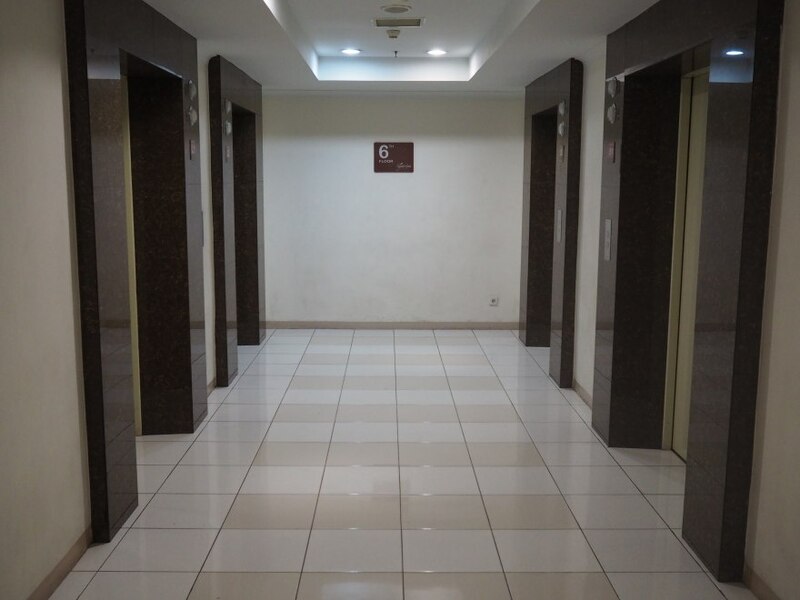 The contractor was Waskita Karya, a large state-owned enterprise that has a long experience building diverse projects (infrastructure, hotels, apartments, etc) such as Shangri-La Jakarta, BNI Tower, and Mandiri Plaza Tower. Signature Park consists of 1 L-shaped tower with a simple design. Each unit has a small balcony and a medium-sized window. AC units are visible from the street. 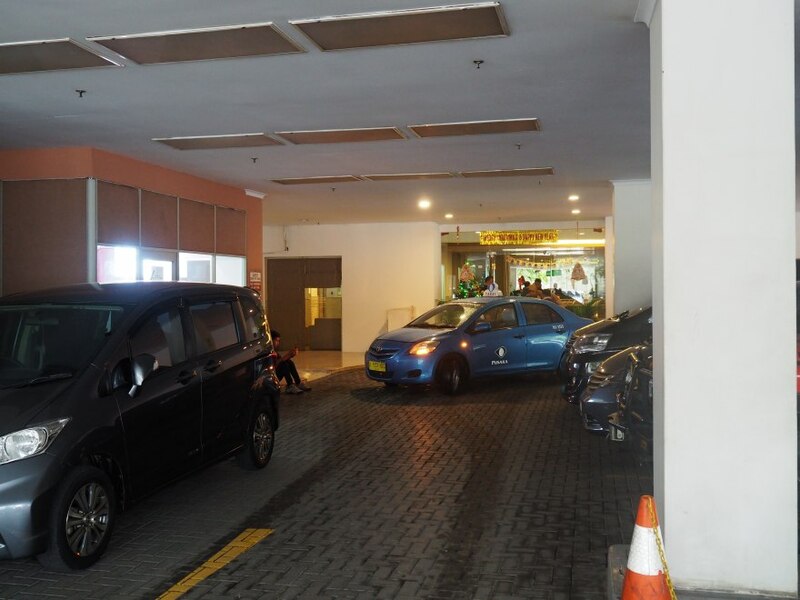 The main entrance is from Jalan MT Haryono, where Signature Park is indicated with a proper sign. The car lobby is a bit narrow and dark as it is located in the parking. The reception is quite spacious and it looks neat. The ceiling is high, the floor has marble tiles, and the sofas are rather comfortable. Basic, with a gypsum ceiling and small ceramic tiles. I liked the wooden doors and frames. 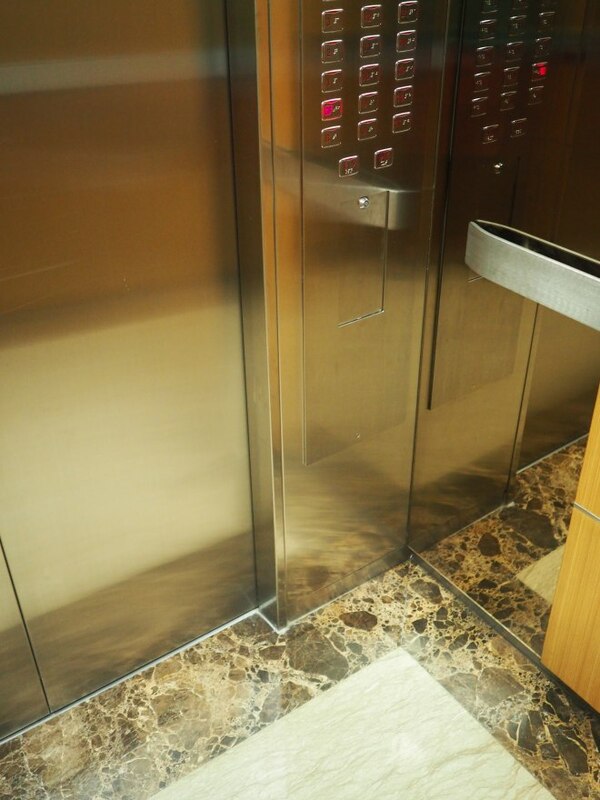 Good quality, even though there are still traces of paints and drips of cement from the construction. 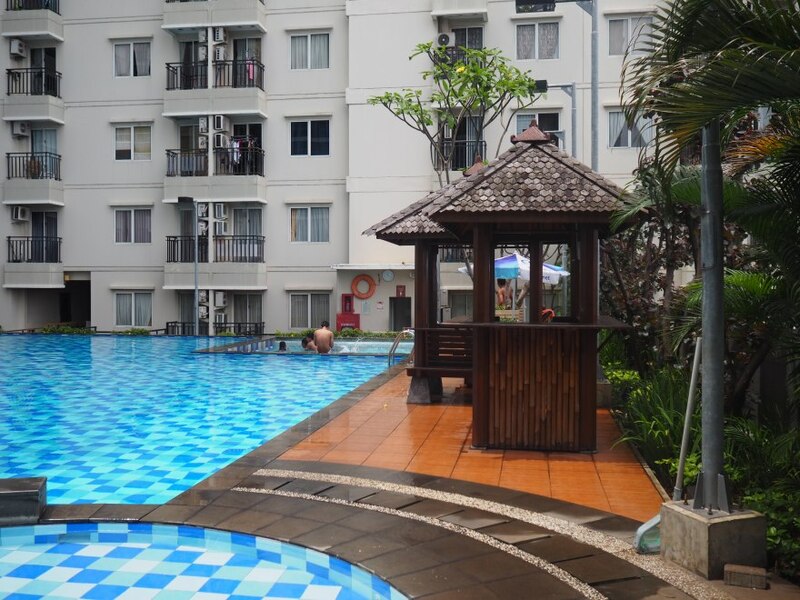 – Swimming pool: It is rather large, with a cold jacuzzi and a pool for kids. There are also a few cabanas and sun beds for people to relax. The only problem is that it is quite crowded on weekends. 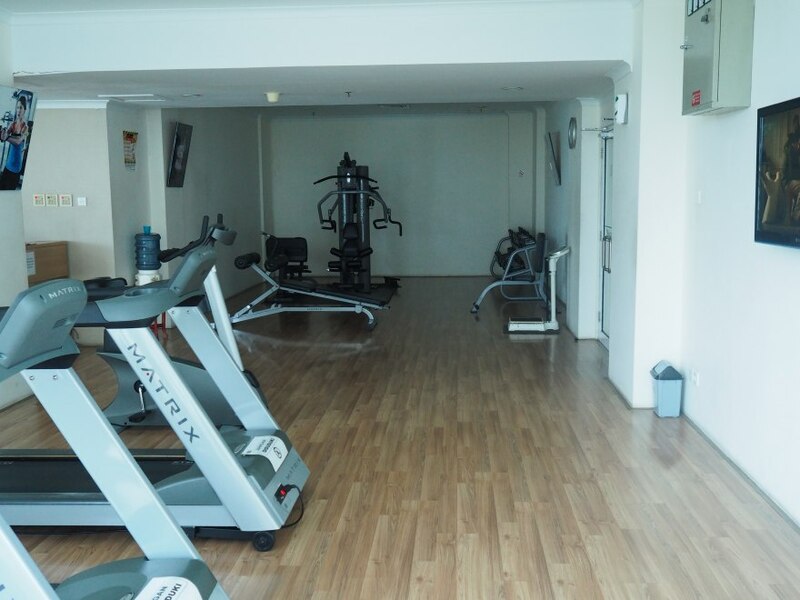 – Gym: Only a few machines (professional) but it is enough for most people. 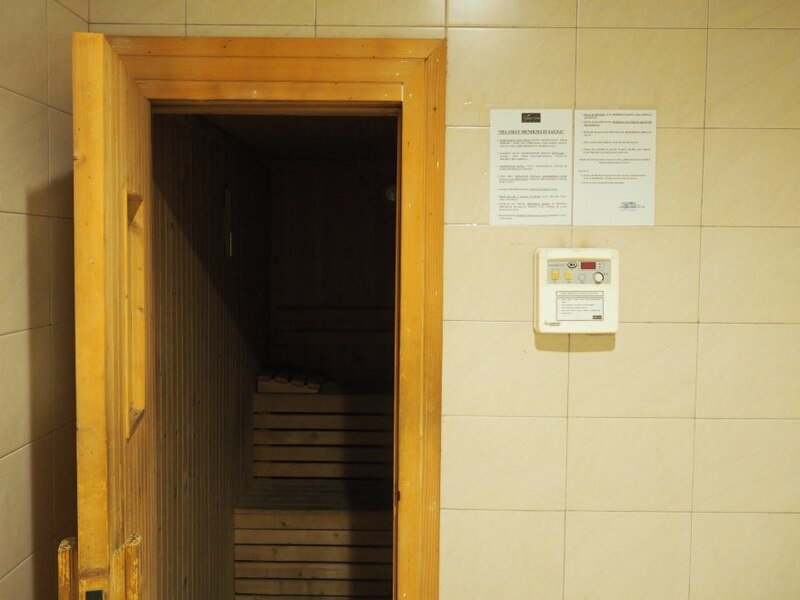 There is a sauna attached to it. 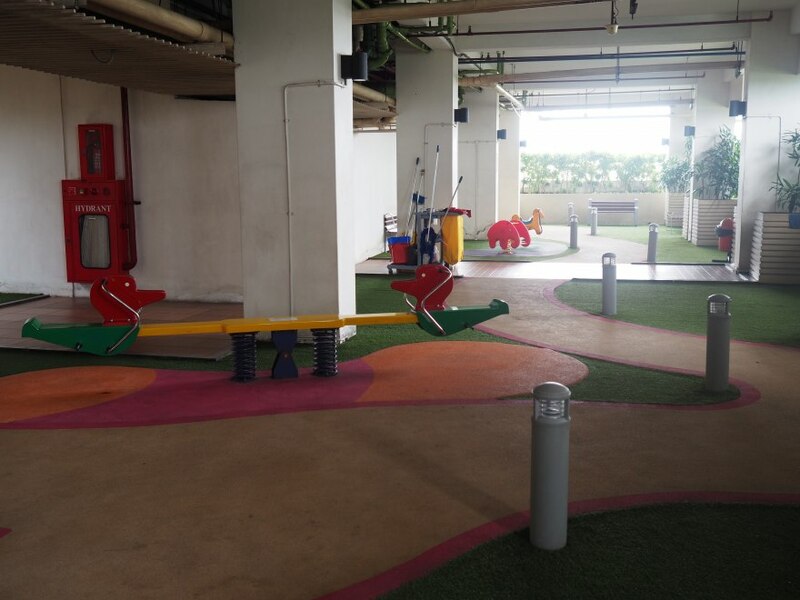 – Kids’ Playground: It could be nice but it is in a corridor that looks like a parking lot. The electric supply is limited. 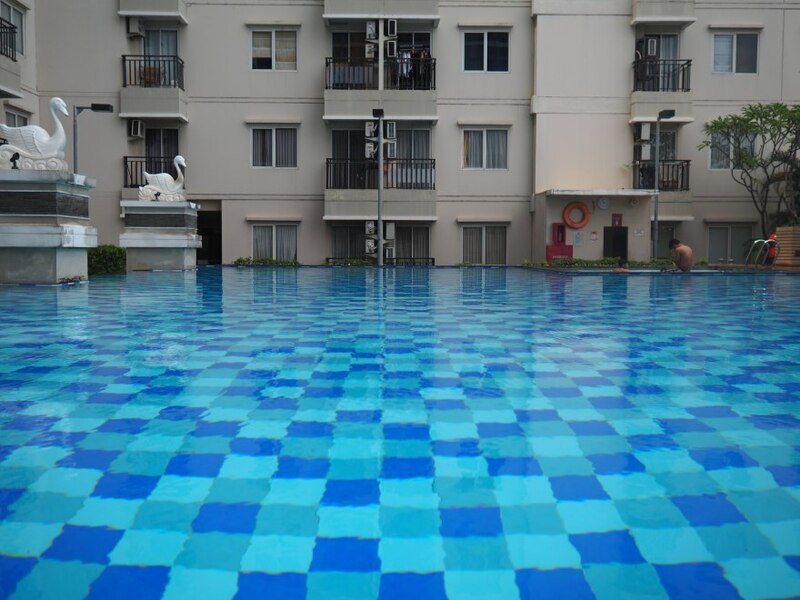 Usually, you will get 1,300VA for a 1-bedroom unit and 2,500VA for a 2-bedroom unit. Do make sure you have a parking spot with your apartment if you own a car. 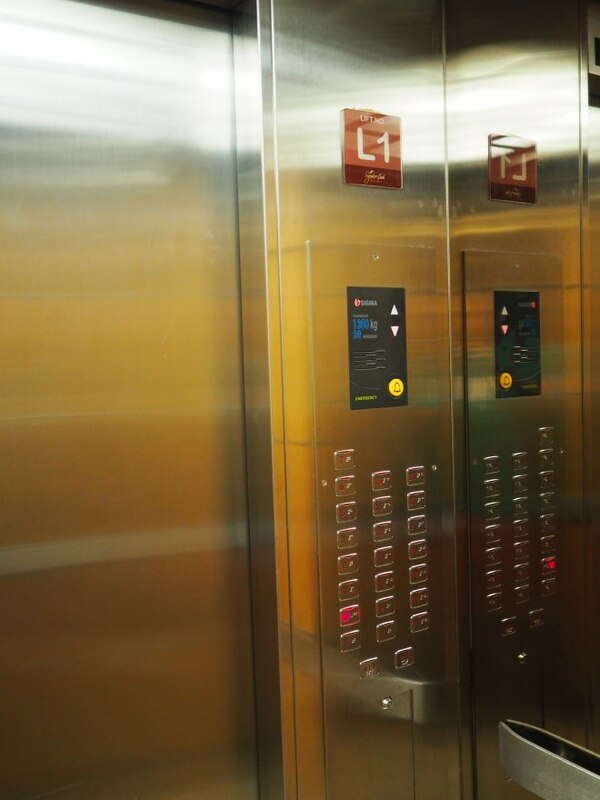 There are 4 lifts per tower. While Signature Park Apartment is still new, I found it was quite busy and I suppose the occupancy is high. A little bit. Naturally, the apartments facing Jalan MT Haryono will have some noise from the street. 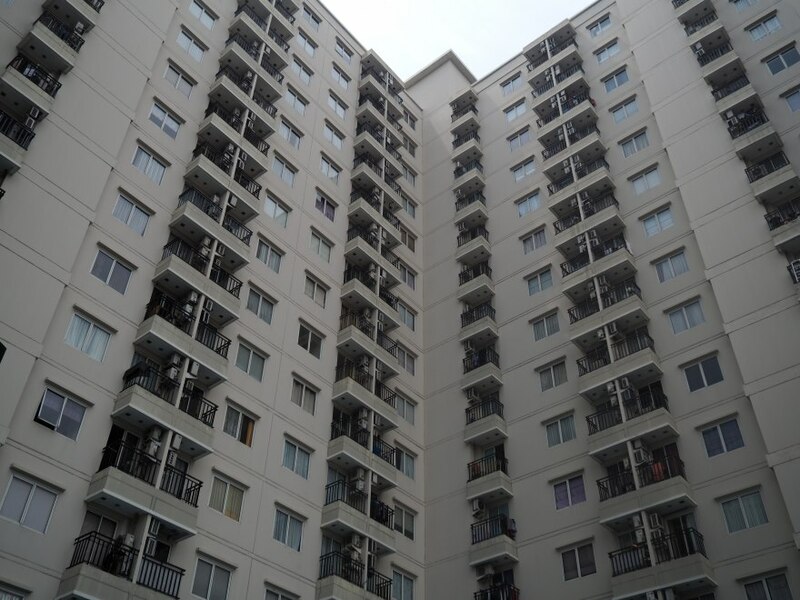 The apartments facing the North will have to hear the mosque from the neighboring kampung. Most residents are Indonesians pribumi, with a few Indonesian Chinese. They are mostly from the middle to upper class. It was completed in 2015. Not too many yet. The paint in the corridor already looks a bit old but it is still acceptable. I found the property to be clean enough. 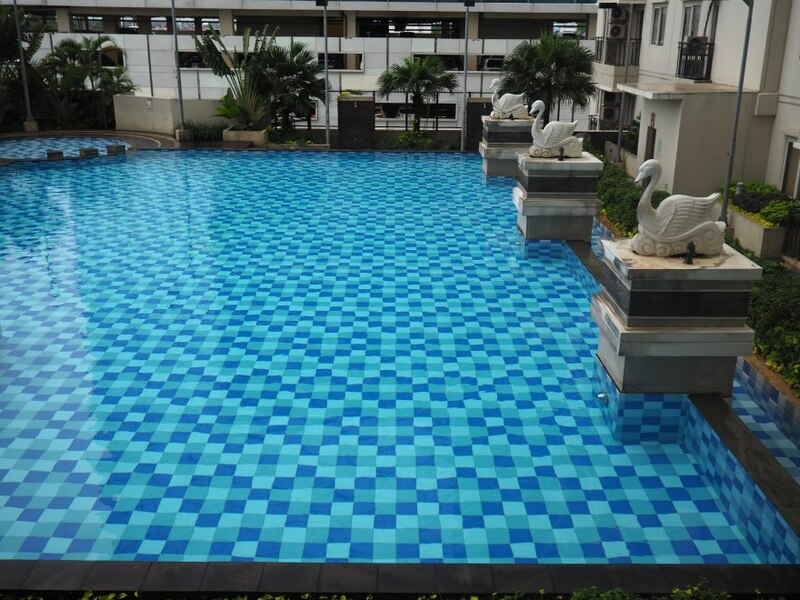 Prices at Signature Park Apartments may vary depending on many factors such as the floor, the unit type, the room condition and the furnishings. Which units are the best? Units facing West have their view blocked by Bellevue Residence. Units facing South have the noise and pollution from Jalan MT Haryono. Units facing the North are the best ones, especially those with a pool view. The current break-even point of more than 13 years for this property is a bit high considering the reputation of the developer. 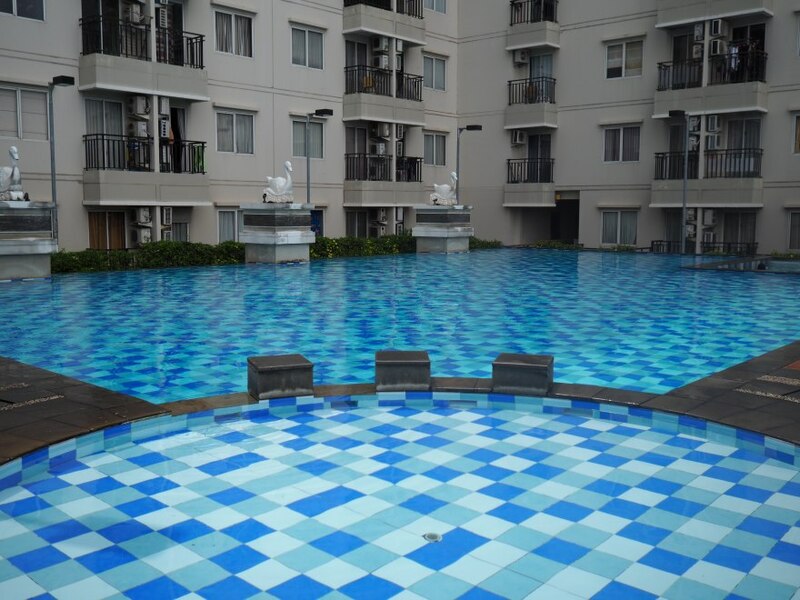 For an investment, I would not buy there in priority as there are better and safer opportunities elsewhere in Jakarta. However, if you are looking for a place to live in that area, with a budget under IDR1,000,000,000, then I would say this is one of the best options.